Published: Sept. 30, 2018 at 01:30 p.m.
Cincinnati Bengals tight end Tyler Eifert slips past Atlanta Falcons defenders for a 15-yard toe-tapping touchdown. 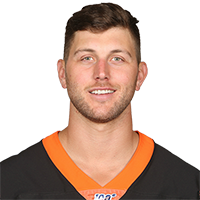 Published: Dec. 11, 2016 at 02:09 p.m.
Cincinnati Bengals quarterback Andy Dalton finds tight end Tyler Eifert again for 5-yard touchdown. Published: Dec. 11, 2016 at 01:12 p.m.
Cincinnati Bengals quarterback Andy Dalton finds tight end Tyler Eifert for a 14-yard touchdown. Published: Dec. 4, 2016 at 02:23 p.m.
Cincinnati Bengals quarterback Andy Dalton hits tight end Tyler Eifert for a 13-yard touchdown.